US ports, because by then the ships will have been delivered that require it. Once that happens, I would expect orders for more LNG-fuelled vessels to increase rapidly. LNG carrier classifi cation we are well placed to offer the gas technology support and risk management that shipping needs as gas-as-fuel evolves. Today, we are involved in LNG-as-fuel projects in North America and around the world. Our work with the Port of Singapore is helping set a template for the development of LNG bunkering in major ports. North America and US Caribbean Sea) and SECAs (currently the Baltic and North Seas) will drop. Dedicated & reliable emission control technologies, such as exhaust gas recircula- tion, selective catalytic reduction, scrubbers are needed. In- stead, LNG may be used as a viable alternative. However, a lot of issues are to be resolved, both on board, for LNK storage capacity, and ashore, in particular looking at ships’ integration with regasifi cation plants and bunkering stations. 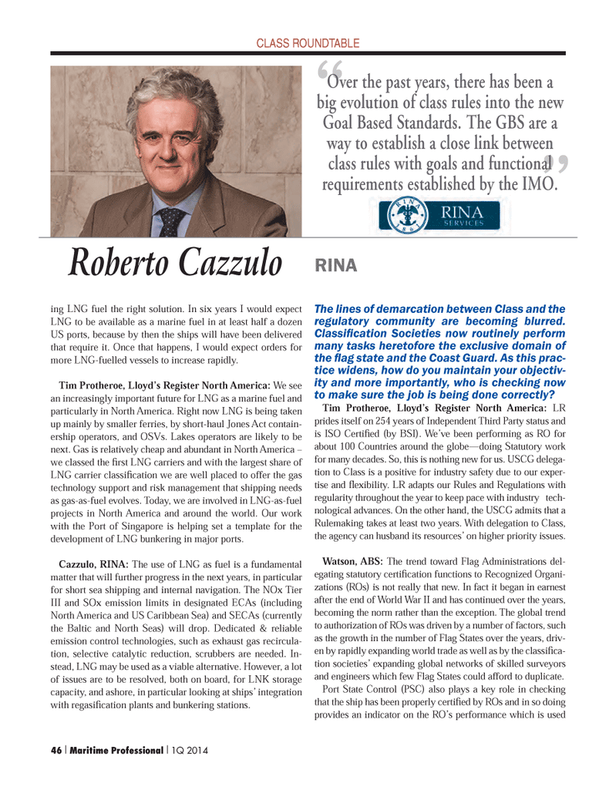 The lines of demarcation between Class and the regulatory community are becoming blurred. Classifi cation Societies now routinely perform many tasks heretofore the exclusive domain of the fl ag state and the Coast Guard. As this prac- tice widens, how do you maintain your objectiv- ity and more importantly, who is checking now to make sure the job is being done correctly? Rulemaking takes at least two years. With delegation to Class, the agency can husband its resources’ on higher priority issues. Watson, ABS: The trend toward Flag Administrations del- egating statutory certifi cation functions to Recognized Organi- zations (ROs) is not really that new. In fact it began in earnest after the end of World War II and has continued over the years, becoming the norm rather than the exception. The global trend to authorization of ROs was driven by a number of factors, such as the growth in the number of Flag States over the years, driv- en by rapidly expanding world trade as well as by the classifi ca- tion societies’ expanding global networks of skilled surveyors and engineers which few Flag States could afford to duplicate. Goal Based Standards. The GBS are a way to establish a close link between class rules with goals and functional requirements established by the IMO.